It's quite easy for me to skip breakfast. I like toast, occasionally cereal, and when I am really feeling naughty I go for a muffin. 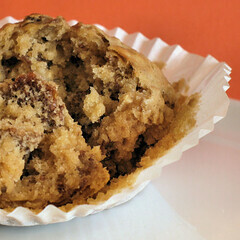 The thing is... there is nothing naughty about this muffin - it's packed full of bran flakes and oats. OK, it's got some sugar - but that will give me energy, right? And if I'm on the run, I can't take the toaster or milk carton with me. These muffins are easy to make, tasty and filling - and you can eat them even when it's long past breakfast time. Put all the ingredients into a large bowl and stir together until well mixed in. Spoon into lined or well-greased muffin cups. Bake for 18-20 minutes until they are springy when touched. This is my entry into this month's Snackshots, hosted by Michelle at Greedy Gourmet. I like the look of those! I've never made muffins before - I will have to have a go. Jan - you gave me a good laugh with all the comment posts - I thought - ooooh, you must really like the look of those, LOL!! Any muffin with oats and honey sounds perfect to me. Plus I love breakfast, so this would be a real treat! I'm very much into healthier muffins these days - these remind me of the double bran muffins we just made - not too sweet but enough to make you feel like you're cheating when you're really not. Thanks for sorting that Nic! How mad was that??!! The PC had a fit there was nothing I could do! Those muffins look good and sound nice and healthy. I love muffins, so easy to just grab one and go! Those look really good! Great looking muffins. I like anything with oats in it - so healthy! Susan - I am into honey and oats lately, but you can't really taste the honey in these. giz - I will take a look at your muffins, sounds delicious. Patricia - well I guess they are healthier than some of the other kinds of muffins, I could eat a plate of these for sure! Jan - that has been happening to me a bit lately - blame it on blogger!! Kevin and LyB - thank you! Hi there farida - thanks so much! I don't eat breakfasts either, but these delicious looking muffins could take met there...AND they're healthy! Like always I love your photography..
First of all, thanks for the lovely comment you left on my blog. Secondly, these are gorgeous.... I love how you capture the color... moist, delicious and healthy!! These muffins look like a tasty breakfast alternative, especially if you're someone who doesn't usually eat first thing in the morning. This would be a great grab & go breakfast. Perfect for on the ride to school. They look delicious! oooh, I could never skip breakfast! I love the look of these muffins though, I could eat them for my 2nd breakfast! Mmm, great minds think alike! I made cherry oat muffins on Saturday :) It seems that in this country if you want healthy muffins (sans choc chips!!) You have to make them yourself ;-) These look heavenly and I'll definitely be trying them soon. Ronell - thank you so much. Aran - welcome, and I am so glad I discovered your blog. Margaret - sometimes I'm too busy to even think about breakfast! Sticky - I can grab one from the freezer and eat it later! 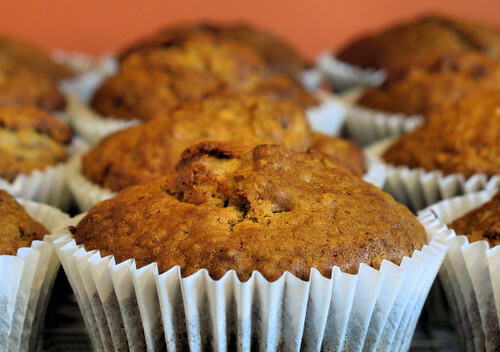 Jeanne - cherry oat muffins sounds really good - hope you post the recipe! Nicisme, I love the muffins and they look perfect! I'll take a dozen or two. I'd happily eat one of these beauties any day for breakfast. I wanted to tell you that I made your muffins, and they were GREAT. Thank you. Alfie - oooh, thanks for the award, I'll pop over! Pixie - I do quite often! Private Chef - I'll pop over and have a look. Vegeyum - I am so glad to hear that you made and liked them, thanks for letting me know! You're baaaaaad, Nic! Don't go skipping the most important meal of the day now; especially if you can eat these scrummy muffins. 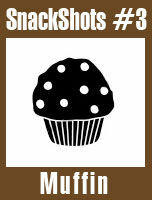 Thanks for participating in SnackShots and don't forget to check out the roundup soon! Thanks Michele and great work on the round-up! ServesYouright - thank you and thanks so much for visiting! hi i really like this recipe and i am going to make it in school. However i need it to be skillful and high in fibre, so could you give me any tips on improving it, such as a skillful topping thats still high in fibre? Mix all the ingredients for the topping together and sprinkle onto muffins before baking. You could also try adding 2-3 tablespoons of wheat bran to the muffin mixture to give them a bit more fibre. A Great British Pud - Fit For A Queen! 1 Year of Blogging & Thank You's! Eccles Cakes - Tried Tested & True! Double Chocolate Raspberry Tart - Perfect!